I'm sort of curious why Clinton got involved in this race at this point. Does he earnestly think Romanoff is more electable than Bennet and thought he could make a difference? Did either Bennet or Obama do something recently to irk Clinton? Is this a proxy war between the Obama and Clinton teams? Alert reader David Karol writes in to say it's all too simple: Bennet was an Obama supporter in '08; Romanoff backed Hillary Clinton. Now, as far as I know, this is the first Democratic primary since 2008 in which Obama and Bill Clinton have backed different candidates. (Does anyone know of any primaries right now involving an Obama supporter versus a Hillary supporter?) But, as David points out, Bill has been very active in helping out Hillary's former endorsers, including Gavin Newsom, Kirsten Gillibrand, and Libby Mitchell. So it's not quite accurate to say that the Obamas and the Clintons are cruising the country looking for a chance to fight each other. It's more like Bill Clinton is repaying those who stood with his wife. Which is evidence that endorsing a candidate that loses is not necessarily a bad thing -- it can earn you the gratitude of some important people. One thing I find interesting is that the Clinton/Obama split in the Colorado primary does not seem to be filtering down to the activist level. I haven't conducted a thorough survey along these lines, but it looks like the 2008 Democratic delegates are not split between Bennet/Romanoff the way they were split between Obama/Clinton. As David suggests, this shouldn't be too surprising, given that one of the main issues that divided the 2008 candidates -- Hillary's vote on the Iraq War authorization -- is not an issue in the 2010 race, nor are the demographic divisions between the candidates. Clinton is not expected to do anything for Romanoff — no fundraisers, no stump speeches — beyond the letter sent out to supporters Tuesday. I suppose the main question, though, is what sort of effect this endorsement will have. This will surely help out Romanoff with his Q2 fundraising efforts. Beyond that, Clinton is now Romanoff's most visible and most beloved endorser among Democratic primary voters. The most recent SurveyUSA poll on this race had Bennet leading Romanoff 53-36, with 11% undecided. That's a huge lead, but this is the only poll we've seen in the past month and a half. I'd feel a lot more comfortable in the finding if more than one poll were used. But let's say it's an accurate reading of the Democratic primary electorate. Can Bill Clinton actually bring the bulk of undecided voters and a chunk of the Bennet voters over Romanoff's way? Keep in mind that, unlike general elections, primaries are actually somewhat volatile. Lacking the party label, primary voters look for some sorts of cues about support and viability. Endorsements and funding end up being highly influential factors in primary elections. Today, Bill Clinton substantially eroded Bennet's advantage on both counts. I wanted to follow up on my soccer post from last week, in which I examined resistance to soccer by conservative opinion makers. Drew Conway had a nice post showing basically no relationship between a country's freedoms and the success of its soccer team. This inspired me to look into the relationship between wealth and soccer success. 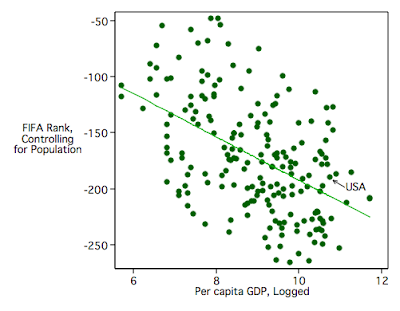 The graph below charts out each country's per capita GDP (logged) on the horizontal axis and its FIFA ranking on the vertical axis (1 is best, 202 is worst). The regression is negative and statistically significant (p=.001), suggesting that for each additional $10,000 a country moves up in per capita GDP, its FIFA ranking should improve by about 4 places. 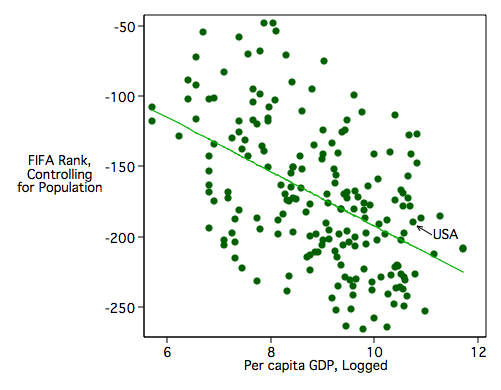 However, as you can see from the smoother line, the relationship switches directions toward the upper end of income. It looks like there's generally a positive relationship between national wealth and soccer success, but the upper end of the distribution is being distorted by some very wealthy nations (Andorra, Bermuda, Luxembourg) with disproportionately crappy soccer teams. So, contra Glenn Beck's rejection of soccer, conservatives should clearly love this sport, since you can buy success. It's all about social mobility. USA! USA! Comments welcome, although please keep in mind that I know very little about soccer, sports in general, or countries not called the United States of America. At this point, based on everything I know about how primary elections actually work, I would say the odds still strongly favor Bennet, McInnis, and Norton winning the August primaries. I'd love to be proven wrong, of course... but given where the money and endorsements are, that's the likely outcome. If the latest polls are to be believed, I may need to eat these words for the Republican Senate primary. Jane Norton appears to be trailing Ken Buck badly, despite having raised twice as much and having spent four times as much as he has and despite having had a real advantage in terms of party elite endorsements. Why are funding and insider support not doing for Jane Norton what they appear to be doing for Michael Bennet and Scott McInnis? Well, for one thing, Norton's most prominent early backer was John McCain, who, you know, doesn't live here, and was never really the darling of the conservatives who dominate the GOP caucuses and primaries. (Romney won the caucus in '08.) People have questioned McInnis' conservative credentials, but no one really doubts his Colorado bona fides. Yes, Bennet's appointment was a surprise, but he had the backing of the governor and much of the state's Democratic leadership. Plus, he had President Obama coming out swinging for him. No, Obama's not from here either, but I think it's fair to say that an Obama endorsement means more to Colorado Democrats than a McCain endorsement means to Colorado Republicans right now. Some of it may also be candidate-specific. Norton might just not be all that good at this. Now, this stuff is much harder to measure, and she hasn't had any sort of Martha Coakley meltdowns. I find her "war on terror" ad disgusting, but of course she's not trying to appeal to me. What seems to be harder for her is that her opponent, Ken Buck, is actually pretty good at this. Unlike other would-be giant killers in the primaries out there, Buck has some political experience and seems to have pretty decent political instincts. Anyway, the primary is still more than a month away, and the polling data is pretty scant so far, so full caveats here. But in this great "anti-insider" year, right now it looks like only one insider will be taken down in Colorado. If that happens, the real question will be, why this race and not the others? 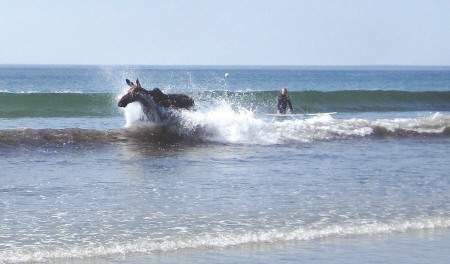 Don't you hate when you've waited on your longboard all morning for the perfect wave and then a moose totally cuts you off? Well, yeah, that happens in Maine. I was struck by how small a role race has played in Barack Obama's presidential campaign and time in office relative to what we might have expected a few years ago. His popular vote total in 2008 was very close to what the leading models forecast, and his approval trajectory in office is very similar to his predecessors. All true. But what do we make of this? Does it mean that race just doesn't matter anymore, at least in our voting decisions? That's possible. But here's another interpretation. Let's just imagine a scenario in which all the white racists in the electorate were members of just one political party. (I know full well this is not the case, but bear with me for a moment.) And let's further stipulate that race matters in this scenario -- voters vote based on their racial sentiments. All the members of the non-racist party, plus a healthy portion of the unaffiliated, would have voted for Obama in 2008, with nearly all the members of the racist party voting against him. Once in office, Obama would have near-unanimous support from members of the non-racist party and near-unanimous disapproval from the racist one. Would such a universe appear very different from our own? This would mean that race still mattered a great deal in politics, but we're at a point in the intersection of race and party where it's almost impossible to distinguish between racial sentiment and partisanship. I'm not saying this is the case, and I'm certainly not saying that all racists are Republicans or vice versa. I'm just suggesting that race might well still matter, even if Obama's election and trajectory in office appear similar to those of his predecessors. It doesn't matter how you try to sell it to us, it doesn't matter how many celebrities you get, it doesn't matter how many bars open early, it doesn't matter how many beer commercials they run, we don't want the World Cup, we don't like the World Cup, we don't like soccer, we want nothing to do with it. So where does this stuff come from? Is it racism? Is it just a right wing media outrage machine trying to find some talking point for the day? Well, maybe, but I'm going to take the position that this is actual principled conservatism at work. America has two great dominant strands of political thought... conservatism, which, at its very best, draws lines that should not be crossed; and progressivism, which, at its very best, breaks down barriers that are no longer needed or should never have been erected in the first place. I think the soccer issue is one instance where conservative leaders are simply trying to draw a line. They feel they've made enough accommodations to other countries and cultures. They simply do not acknowledge soccer as an American pastime and feel they are justified in trying to exclude it from our main culture. We cannot just keep adding things to our nation and assume that the nation will still stand for anything. Lines must be drawn. This far, no farther. It actually reminds me of a story my grad school mentor John Zaller told me about a conversation he'd had with a conservative colleague back in 1982 after this person had seen "E.T." Apparently, Zaller's colleague was furious with the movie because it represented Hollywood liberals admitting space aliens into the human family. And yes, it kind of did that. As Zaller summed up (and here I'm quoting from memory), "Leave it to liberals to admit space aliens into the human family, and leave it to conservatives to be offended by it." I learn from Jon Bernstein that political bloggers are supposed to have something to say about World Cup soccer. I really don't have anything here. 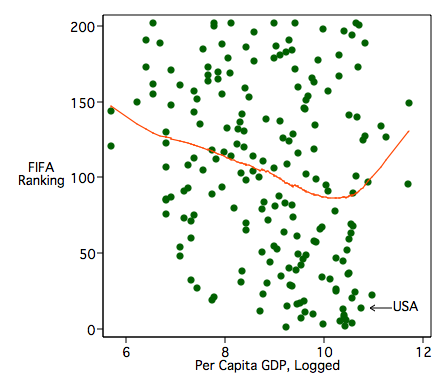 I can't believe that the growth of soccer in the U.S. represents either a good or bad thing. If you want to play, play. If not, whatever. I rather enjoy the idea of longtime international adversaries taking out their aggressions on the soccer field, but the matchups rarely seem to work out that way. I've just never had really strong feelings about Slovenia one way or another. The one thing I hoped to bring to the table has already been mentioned by Dana at Edge of the American West. But I'll say it anyway. If you have an iPhone, go download the free vuvuzela app. You never know when it might come in handy. I plan on using it during my kids' soccer games this fall. A fantastic thing is and we in Ireland are very, very happy about this - is the fact that America has now joined the fight.... Once the American media and the American people get involved in this, then it's all over. It's only a matter of time before, you know, the truth outs. I believe that the Holy Spirit is pure love and pure compassion. I don't believe it's judgmental. I believe it's horrified by what's been happening to children and what's been done in its name. Anything that's horrified by someone's actions is... well... judgmental. Okay, it's the good kind of judgmental in this case, but still. 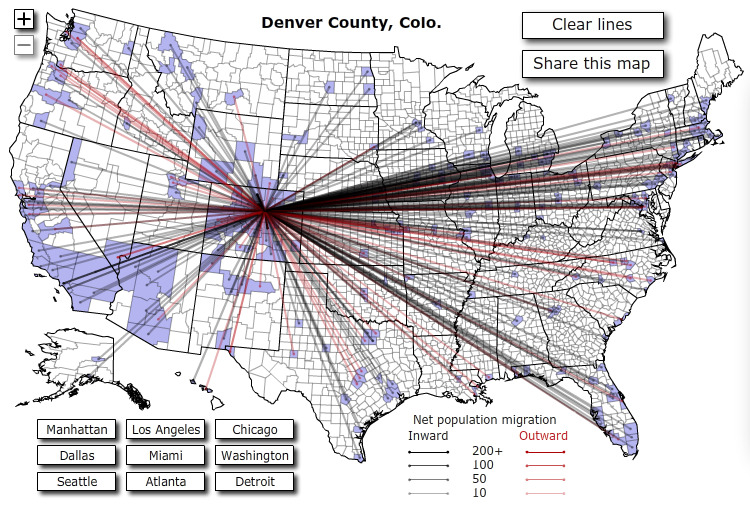 Via Scott McClurg, Fortune has put together a very cool visualization of county-to-county migration in 2008. 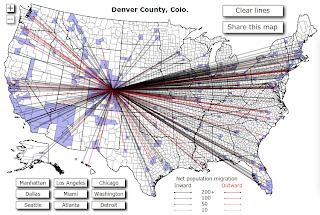 Below is a map of migration into (black lines) and out of (red lines) Denver, confirming that people come here from LA and eventually leave for Portland or Seattle. 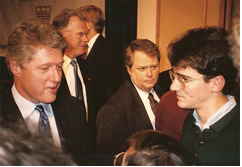 Jon Bernstein had a post recently asking whether President Clinton moved toward the center following the 1994 election. Bernstein largely comes down on the side of no, although he cites a Brendan Nyhan post offering evidence that Clinton did moderate somewhat. Actual quantitative evidence of presidents' ideological dispositions (no less shifts in them) is difficult to come by. For what it's worth, I was working for Clinton during this election cycle. While my low-level job was far removed from the Oval Office, in terms of both geography and power, there was a sense of moderation felt throughout the office in the wake of the '94 midterms. 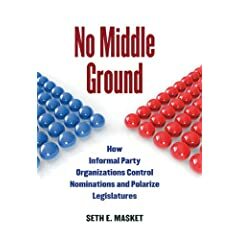 Now, only in the broadest, non-political sense does a making a chaotic office more professional constitute a rightward shift. But I also had a sense of movement toward more conservative public policies. As a letter writer, one of the issue areas I dealt with was health care. I recall working on a letter in early 1995 related to the treatment of drug abuse as a public health problem. I wish I could remember the specifics of the policy, but there was a notable shift between 1994 and 1995, where the White House was no longer supportive of providing certain funds to help those dealing with drug addiction. This sticks in my memory because I remember double-checking with the Office of Domestic Policy about it, as it seemed like we were adopting the Republican position. I then had to check yet again when my supervisor didn't believe what I'd written in the letter. I believe there were other modest shifts in policy around then, although nothing that would generate major headlines and nothing that sticks out in my head. I generally support the idea of becoming an expert on something rather than generalizing on everything, even if I don't always follow this advice. You never know when your area of specialization will become hot. People who studied vote counting and election technology were generally considered geeks until the 2000 presidential election -- suddenly they were booked on every news show and in every courtroom in the country. 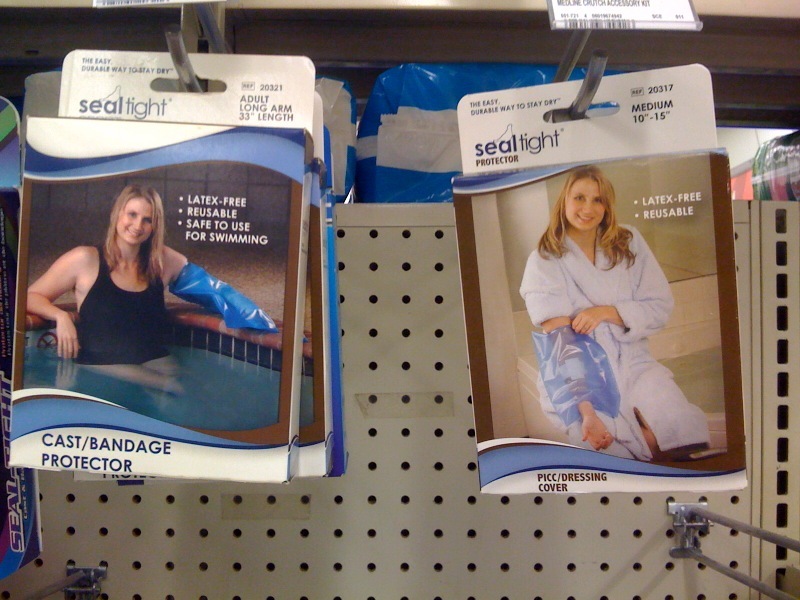 Yes, that's the same model. 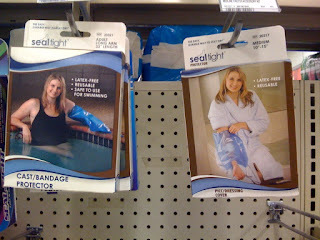 She models for cast/bandage protectors and wound dressing covers. You may never find yourself trying to sell a cast protector, but if you do, she's going to be on your call list. 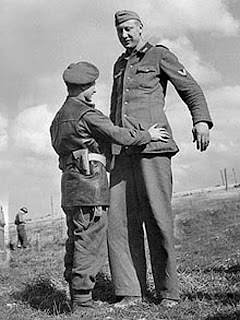 At left is a 7'6" German soldier surrendering to an Allied corporal two feet smaller. 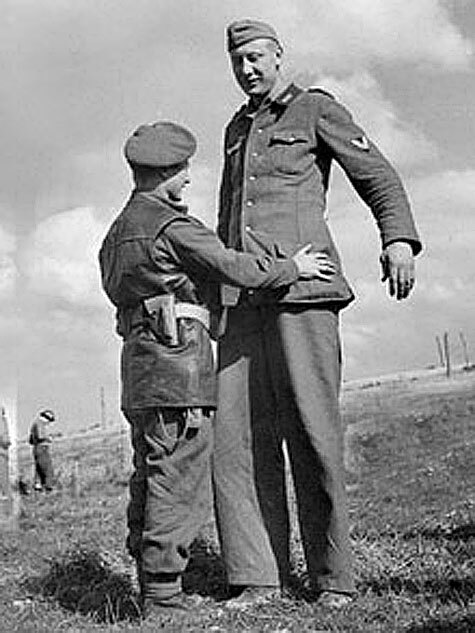 That's one big Nazi. The Washington Post's Dana Milbank offers an interesting, if somewhat catty, new take on Andrew Romanoff's Senate campaign. It turns out the two worked together at the Yale Daily News many years ago. So, what was Romanoff like back then? The editor was a talented but prickly junior by the name of Andrew Romanoff. He clashed so fiercely with the newspaper's business staff that he and the publisher communicated only through memos. Instead of putting all effort into the newspaper, energy was wasted on internal squabbles. Rather than furthering the causes they agree on... Romanoff is provoking a Democratic family feud. I don't purport to be objective here or to know anything more about Romanoff than Milbank does. But I can't help but be irked by Milbank's dismissal of internal debate. For example, there is more than one way to run a campus newspaper. Editors and publishers occasionally argue about substantive issues. I have no idea what sorts of issues Romanoff and his publisher clashed over. Perhaps they were trivial, perhaps they were consequential. Milbank gives us no indication. So if Romanoff just likes to be a jerk, that's useful information. But it would also be useful to know if he fights tenaciously for things that matter. All Milbank has done is suggest that because Romanoff disagreed with others on the newspaper staff, that's somehow a bad thing. It's the same with Milbank's discussion of the current Senate race. No, there's not much ideological distance between Romanoff and Bennet, but does that make it wrong to have a contest at all? Romanoff may be more electable than Bennet, although the latest polling evidence on that question is mixed at best. Is that not a legitimate question on which to debate a nomination? Also, Romanoff has chosen to make corporate funding of campaigns a major campaign issue. Now, of course, corporate spending is not quite the same thing as corporate influence. But is this not a legitimate matter for debate, particularly at a time when the public is so focused on the question of how the federal government should deal with corporations like BP, AIG, and GM? Nominations contests are far more than "internal squabbles" or "cynical fratricide," in Milbank's parlance. They are how a party decides what it stands for and who will represent it. Given how rare competitive primaries are these days, this doesn't strike me as something a political reporter should be criticizing. Drew Conway, a poli sci grad student at NYU, has a post up encouraging graduate students to blog (h/t Monkey Cage). I basically agree with all his points, particularly the first few. That is, grad students really do have something to say, and blogging is a nice way of developing your ability to describe research in a concise and accessible way and to promote yourself. In particular, I think this sort of writing exercise can be very useful in the first few years of grad school. As I recall, my writing became considerably more technical and obscure during my first two years of school as I learned lots of new statistical techniques and jargon. I think (or at least I hope) that my writing has moved back toward the accessible since that time, and at least part of what has motivated me to do this is my desire to reach an audience outside academia. Blogging can probably help students retain their accessibility as writers even as they learn lots of obscure material. Now, I should mention that if there are risks to academics who blog (a point of some debate), those risks are an order of magnitude greater for graduate students. If you make very public claims that turn out to be wrong, if you insult powerful people, if you misrepresent yourself, if you use false data, etc., that could damage you at a time when you're extremely vulnerable. Hiring committees can afford to be very selective when there are 150 applications for one job; they don't need too many excuses to toss a file aside. But, while I would urge caution, I think there are great rewards for those who blog, and I also think it does our discipline a great service. So California is going to try the Louisiana-style primary. 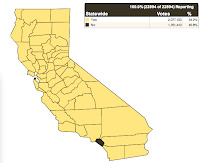 I can't say I'm thrilled that Californians voted for Prop. 14. For one thing, it means that this blog doesn't have nearly the political impact I thought it did. For another, I just don't think it's a particularly good law. As I've mentioned before, the research on this subject suggests that this won't do a whole lot to reduce partisanship in California's legislature, and even if it did, weak partisanship isn't necessarily something to aspire to. Beyond that, this new law will reduce the number of minority party candidates appearing on the general election ballot. If you like to vote Peace & Freedom or Libertarian or Green, or if you're a San Francisco Republican or an Orange County Democrat, you're not going to find many candidates from your party on the general election ballot anymore. It's not terribly surprising that this initiative won, of course, as it was prominently opposed by leaders of both major parties in the state at a time when they're historically unpopular. I imagine the calculation many voters made was, The parties hate 14, I hate the parties, ergo I like 14. Indeed, it's fitting that the initiative passed in every county save two -- Orange County and San Francisco, probably the two most openly partisan counties in the state and the hearts of the state's Republican and Democratic establishments, respectively. All this said, I'm actually curious what will happen, assuming the lawsuits against Prop. 14 fall flat. We actually don't have very many cases of states trying this sort of primary system. Maybe it will measurably reduce legislative partisanship. And while California's own history shows weak partisanship to be dangerous, the state currently has partisanship to spare. Of course, partisanship is far from the state's major problem right now, but at least from a research perspective, I'll be watching to see what we can learn. Allegedly, university faculty are judged by their commitment to three main aspects of their jobs: research, teaching, and service. Of course, in practice, those three areas aren't weighted equally. Many universities place a much higher premium on research than anything else. Liberal arts colleges often put greater emphasis on teaching. But service? Does anyone actually care? At least according to a panel I attended at the State Politics & Policy conference last weekend, the answer is yes. But it's complicated. At this panel, several political scientists talked about a broad range of work they do outside the research and teaching spheres, from political consulting to expert testimony to creating nonprofit organizations. Dan Smith argued that there was not a zero-sum tradeoff between such service and research -- his work providing testimony on direct democracy cases not only helps him generate ideas but also provides him with new datasets on an issue very important to his line of research. Regrettably, as David Adamany noted, such service appears to be on the decline. He examined APSA presidents in the mid-20th century and found that nearly all had some involvement in politics or government on the side. The past seven APSA presidents have no such activity in their résumés. My sense is that political scientists are doing a lot more service than is generally known. We just don't write about it. I'm guilty of that. I've done quite a bit of activity with Colorado's Democratic Party over the past few years, work that has helped inform both my research and my teaching. I like to think of this blog as a form of service to the discipline, as well. But these activities don't show up on my CV. Why? Probably because I fear that they'll be judged harshly by some other academics who are also secretly doing service on the side but don't want to talk about it. It's a vicious circle. I'm curious what people think about this. Are there tenure committees or hiring committees that actually look down on academics for their involvement with political activities like campaign work or consulting or expert testimony? Or have we just been socialized to believe it's inappropriate to discuss it? I'm at the State Politics and Policy conference right now. In addition to the usual panels on, well, state politics and policy, there have been a few special panels on the relevance of our research to the rest of the political world. These have been fascinating glimpses into both the mindsets of political actors and the perceptions they have of academics. The first event was a panel discussion with former governors Madeleine Kunin (D-VT), Jim Edgar (R-IL), Parris Glendening (D-MD), and Bob Taft (R-OH). When asked how political science could be more relevant to state policymakers, they advised us to look into a number of different topics that they thought might be of concern. Taft thought we should investigate the effects of redistricting. A few were interested in legislative partisanship. Kunin mentioned campaign finance reform. What really struck me was that they were pleading for research that already exists, largely done by scholars who were there in the room. This research just isn't making its way into the hands of state policymakers. One way that we could possibly get more of our research placed in front of state leaders, the governors suggested, was to build ties with their staffs. We could contact them through our university lobbyists, we could invited staffers to speak in our classes, etc. Some of us are doing this, of course, but in general this strikes me as solid advice. Then the staffers would be more likely to seek out our research, involve us in the legislative process, or invite us to testify. Of course, another way to communicate with policymakers is via the media. We had a fascinating panel discussion with four seasoned reporters who used to cover statehouses. When asked how we could be more relevant to them, they basically suggested we become more like journalists -- write in more accessible language, focus on solutions, etc. They advised us to blog! I had a fun back-and-forth with David Yepsen (formerly of the Des Moines Register) in which I suggested that we had different perspectives. For example, I research partisanship, and when I talk to reporters about it, they ask me what we're going to do about this problem. I have two reactions to this: 1) I don't really see partisanship as a problem; and 2) Even if I did, I got into this line of work to study the phenomenon, not to get rid of it. I didn't get a lot of good/bad training in grad school. I'm far more interested in understanding how the political world works than in changing it. Yepsen seemed surprised -- You have no feelings about this one way or another? You're just a planted pot? -- and he urged me to explain to reporters how I felt. But this is where I'm uncomfortable. My expertise is in understanding. I don't know that I'm any more qualified to say what's good or bad than anyone else. At any rate, the discussion just reminded me of the real disconnect between academics and journalists, although I'm sure we can be doing more to communicate with each other. I'm on my way to the 2010 State Politics and Policy Conference at the University of Illinois in Springfield. (You can see the program by following the link.) I've actually been dubbed one of the official tweeters of the conference, so please feel free to follow me on Twitter. The official conference hashtag is #sppc. What tore Al and Tipper apart? Another sad sign today of the toll that public life can take on families: Former vice president Al Gore and wife Tipper have announced they are separating. Public life? Really? They've been married for forty years. Their marriage withstood 16 years of his congressional service and eight years in the vice presidential mansion, plus a tragic presidential race. He's been in private life for a decade now. We don't know what split them apart, but it probably wasn't "public life."